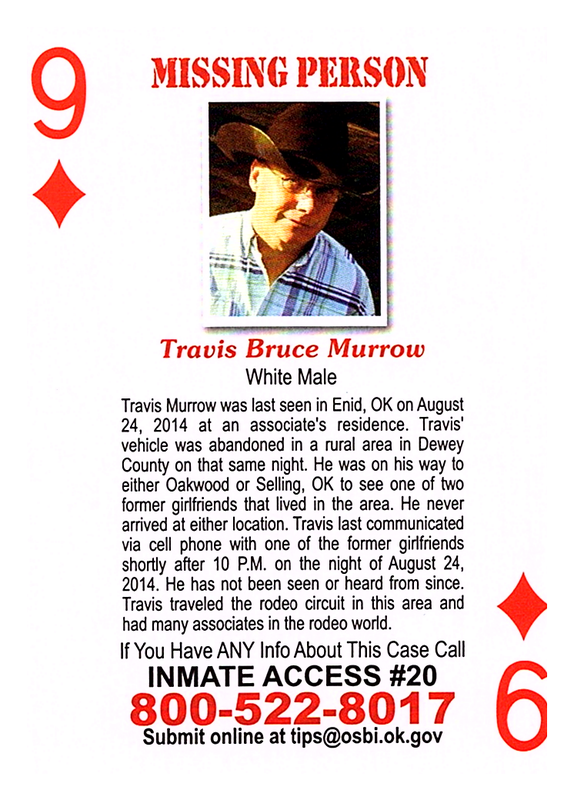 Travis Murrow was last seen in Enid, OK on August 24, 2014, at an associate's residence. Travis' vehicle was abandoned in a rural area in Dewey County on that same night. He was on his way to either Oakwood or Selling, OK to see one of two former girlfriends that lived in the area. He never arrived at either location. Travis last communicated via cell phone with one of the former girlfriends shortly after 10 P.M. on the night of August 24, 2014. He has not been seen or heard from since. Travis traveled the rodeo circuit in this area and had many associates in the rodeo woad.